I love Zultanite so much! 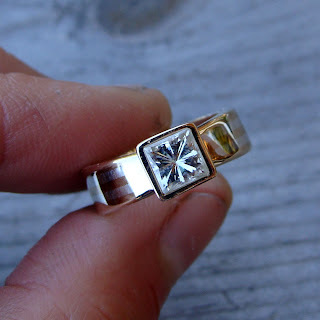 I think it makes for a really unique alternative to diamonds or moissanite for a wedding ring. This one isn't quite finished yet (the stone hasn't been set; it's just temporarily perched atop the bezel) but I thought I'd share it with you all anyways. It's in its second incarnation (original here), and I like this re-worked version so much more than my first attempt. I've given it a heavier, tapered handmade bezel, and I've narrowed the band down in front to meet the new, narrower base of the bezel. 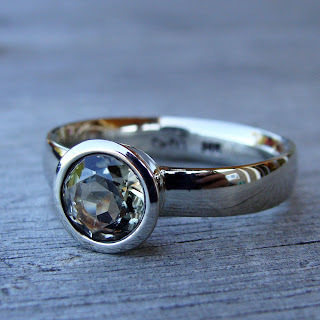 I'm just catching up with your blog...the redesign of the square bezel ring is amazing! I liked the original, but this one is really outstanding. The narrowing really gives it great style. 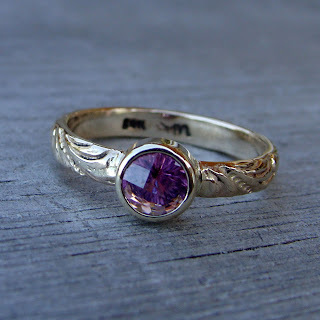 Your other rings are gorgeous too, and I do like the vintage rings, especially the one with the amethyst stones. 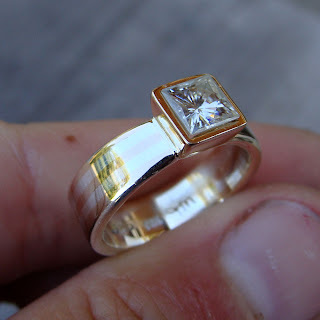 I don't have enough fingers on my hands - I'd want to wear all of your rings! They are all so gorgeous, how can someone pick just one? I already wear 4 rings on my fingers (2 made by you, and 2 made by me... gotta be fair LOL) and I'd buy and wear many more from your collection.